The ultimate excitement for any catfish enthusiast is to maintain a species in the aquarium that has never been (or will never be) encountered in any LFS. I was fortunate to come across this unique distinction in briefly owning a bladefin catfish (Encheloclarias curtisoma). This species was described from the peat swamps in northern Selangor in the Malay Peninsula and my fish was caught from the same area not long after the initial find. 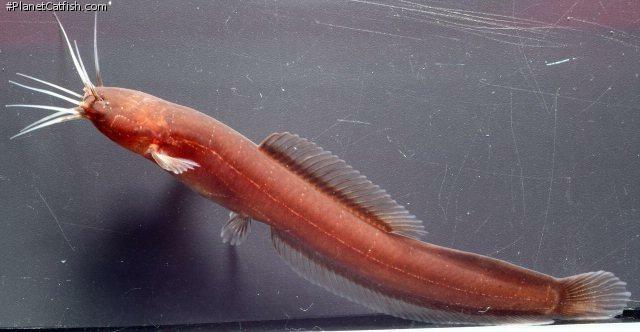 The genus Encheloclarias consists of six species (E. baculum, E. curtisoma, E. kelioides, E. prolatus, E. tapeinopterus and E. velatus) of very rare and poorly-known clariid catfishes from Southeast Asia. They basically look like slenderer versions of their better-known African cousins, the vundu (Heterobranchus spp.) and are the only Asian clariids with an adipose fin. Encheloclarias are also unusual for clariids in having a relatively poorly-developed arborescent organ, although they are still able to (and will) utilize atmospheric oxygen for respiration (see account below). The following account is my experience with a bladefin catfish I briefly kept in the late 1990s. This account is modified from an earlier version written for the May 1997 issue of the now defunct North American Catfish Society. Before taking the catfish home, I was able to observe its behavior, since it was residing in a large tank together with some kissing gouramies, two-spot cats and large rasboras. I could see that it was territorial and would pursue tankmates whenever they came too near its hiding place. When it was not chasing other fish, it spent the rest of the day wedged under the filter or against crevices in the driftwood. I decided that it would be better off without tankmates and so I gave it its own (smaller) tank, crammed full of driftwood so that it wouldn't lack hiding places. The moment I introduced it to the new home, it promptly disappeared into the woodwork. Come feeding time and when I introduced some bloodworms into the tank, it promptly poked its head out and started looking for food. Like most other clariids, it would try to rearrange the substrate (note: this is not a fish for a planted tank) and whenever the lights went off in the room, one could hear it trying to burrow into the gravel by vigorously shaking its head from side-to-side. It is believed that in the wild, the fish actually spends most of its time burrowing into the peat substrate (which may explain the rarity of encounters with this catfish). My bladefin cat was typically a clariid in its choice of diet, i.e. not too particular about what it ate. It seemed to relish bloodworms very much, an observation supported by the fact that the guts of wild specimens revealed a considerable amount of midge larvae. Unlike most clariids, the bladefin cat will seldom come up for air unless it is severely stressed or the dissolved oxygen in the water is very low (because of the poorly-developed arborescent organ). The habitat of bladefin cats in the wild consists of very acidic (pH 4), tannin-stained blackwaters. Such habitats are generally associated with peat swamps and they hold a veritable treasure trove of aquarium fishes, including clown rasboras, chocolate gouramies, combtails, two-spot cats, glass cats, and spiny eels. These habitats are also highly endangered, since the swamps are home to many valuable timber trees and are very prone to being logged. Type Locality Blackwater stream, peat swamp forest at 39 km milestone on road to Tanjong Malim from Sungei Basar, Selangor, Malaysia. Size 82mm or 3.2" SL. Find near, nearer or same sized spp. Identification Catfishes of the genus Encheloclarias are restricted to the blackwater habitats of Sundaic Southeast Asia. They are the most poorly-known of Asian clariid catfishes and are easily distinguished from Asian Clarias by the presence of a moderately long adipose fin that is not supported by extensions of the neural spines. Distribution Asia: known so far from Selangor, Peninsular Malaysia. Furniture Occurs in a stream about 3 m wide and half a meter deep in a peat swamp forest. The stream has a soft and peaty substrate, covered with large pieces of wood and submerged branches. References Ichthyological Exploration of Freshwaters v. 4 (no. 1), pp32, Figs. 9-10.